This may not look like it, but these slots are: Cow (in diamond), Jeremy (in ruby) and nothing in jade. The Cow seems like it has gone out of its slots, but it's actually still here (its effect is still active, and when I dragged the Cow back into its slot it didn't cost me any swaps). Also, both Jeremy and Cow (when back in its slot) are shown as "empty slots" when you highlight over them. I added another spirit in the jade slot, and it displayed fine (no "empty slot" sign, effect worked). 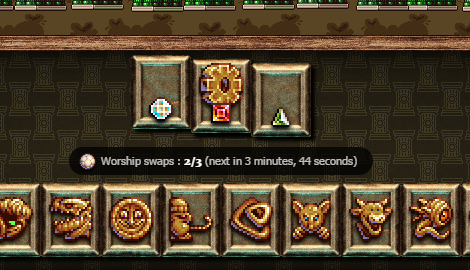 This may be something like a lag spike, or a reload that didn't work quite well, but this is the first time a visual glitch has ever happened to me on cookie clicker, so there's definitely something beyond bad browser or whatnot. I had this bug happen to me as well. When I opened CC today, the cow spirit was gone from my pantheons. I tried refreshing but that did nothing. Another lost spirit, this time Dotjeiss from the beta. Prior to it disappearing from the slot, it was still visible there but it was as though it was empty as no info came up when hovering over it.